Have a damaged gear without OEM prints? Our engineering expertise and extensive history offers our clients a complete suite of services from reverse engineering sample parts to recommending manufacturing modifications. No matter how broken your gear might be, our engineers can design and develop CAD drawings with minimal information using our vast experience and the assistance of gear data software created by one of our founders. Since we understand the importance of production, we also offer expedited services to our customers. 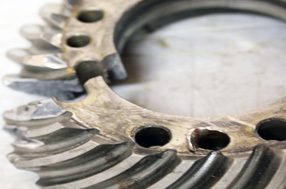 If your worn gear is still being utilized in daily operations, we can reverse engineer and quickly return to minimize your downtime until a scheduled repair. For more information on our services or to obtain a quote, click here to contact us. Our experienced team can provide design consultation, assessments, recommendations, and reverse engineering services for all types of gears from existing parts to prototypes. As an industrial buyer, you strive to source goods that will fulfill your production schedule, are cost efficient, and of uncompromising quality. As a gear supplier, B&R delivers precision parts, on-time, and within your budget. Through our in-house manufacturing process, we are able to offer direct communication with each of our departments and customers alike ensuring the highest quality for each job and achieving overall customer satisfaction. 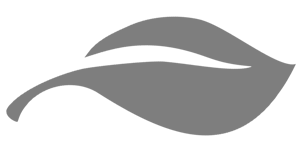 From initial request to delivered parts, we make your procurement process straightforward and effortless. To further reduce lead times, we keep various grades of domestic, alloy steel up to 18” in diameter in stock. We proudly partner with a leading steel supplier for all other grades and sizes. 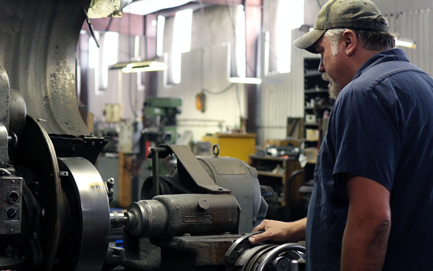 Since we have an extensive equipment inventory, we are able to complete each process completely in house, including operations such as turning, milling, and grinding. Specializing in small batch gears from 1” to 80” in diameter. Our high quality precision parts are cut to AGMA quality standards. With an impressive lineup of Gleason equipment, our bevel gear cutting capacities rival even the largest gear suppliers. Our heat treat facility performs a full range of services including: Annealing (Normalizing and Stress Relieving), Quenching, Tempering, Flame Hardening, Carburizing, Thru Hardening, and Sub-Zero Treatment. We produce all gears to AGMA standards. Each job is shipped with a complete inspection report detailing all critical dimensions. Mounting distance, backlash, and photos displaying the correct contact pattern will also simplify your installation.